Play this systems of equations game alone or with another student. 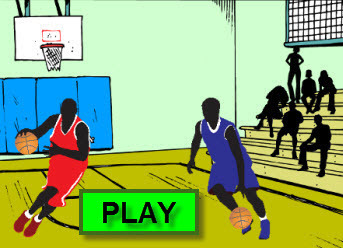 This game can also be played at school by dividing the classroom in two teams. Have fun solving equations! You can play this game alone, with a friend, or in two teams. This game is a multi-player game that can be played on computers, Promethean boards, smart boards, iPads, and other tablets. You do not need to install an app to play this game on the iPad. Have fun evaluating algebraic expressions! Return from Systems of Equations Basketball to Math Basketball Games, or to Math Play.